What is Mobi-C and How Does it Work? Mobi-C is the first cervical disc FDA approved for one and two-level indications and is used to help minimize pain and symptoms associated with bulging or diseased cervical discs. During an artificial disc replacement, the diseased disc will be replaced with the Mobi-C prosthetic disc to restore disc height, the distance between two vertebrae. Because there are no invasive keels or screws required for Mobi-C placement, the patient will be able to enjoy stabilization without sacrificing range of motion. Is Artificial Disc Replacement with Mobi-C Effective? Recently, Dr. Bae presented 48-month data comparing the Mobi-C cervical disc to ACDF at the 2013 North American Spine Society Annual Meeting. While average neck disability scores and improvement were similar among both patient groups, reoperation rate was significantly lower for Mobi-C compared with ACDF. The study also showed that safety and efficacy were significantly better with Mobi-C, supporting the notion that this innovative technology has the ability to provide patients with not only an alternative, but a superior treatment to fusion. 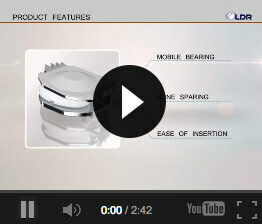 Rising interest regarding motion-preserving spine technology is changing the landscape of the industry. More and more surgeons are offering advanced surgical procedures to meet the demand of patients looking to maintain as much spinal range of motion as possible. How do you know if the surgeon you’re considering is qualified or is simply changing with the times? Dr. Bae is extremely knowledgeable in how the device works and implementation. He has numerous patients who have been enjoying pain-free lifestyles with Mobi-C for 5+ years and is qualified to determine if you are a good candidate for artificial disc replacement using Mobi-C. For more information or to schedule an in-office consultation, contact The Spine Institute Center for Spinal Restoration at (310) 828-7757.